The paprika in this recipe makes it a vibrant, satisfying dish with a sunny, Mediterranean flavour. It can be enjoyed as a starter for six or as a filling main for four. for 3–4 minutes until softened. Add the Flavour Pot and vegetable stock and bring to the boil. 8 minutes until cooked through and piping hot. 3. Stir in the orange zest and juice and ladle the soup into wide bowls. Scatter with parsley and serve with crusty bread. 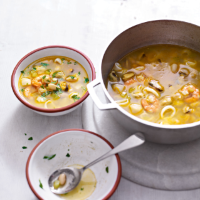 For a fish soup, try swapping the seafood for Waitrose Frozen Firm & Flaky Fish Pie Mix. For a warmer, sweeter flavour, add some diced chorizo with the celery and garlic at the beginning.